I was pleasantly surprised when I unloaded three bins of Halloween decor two weeks ago. 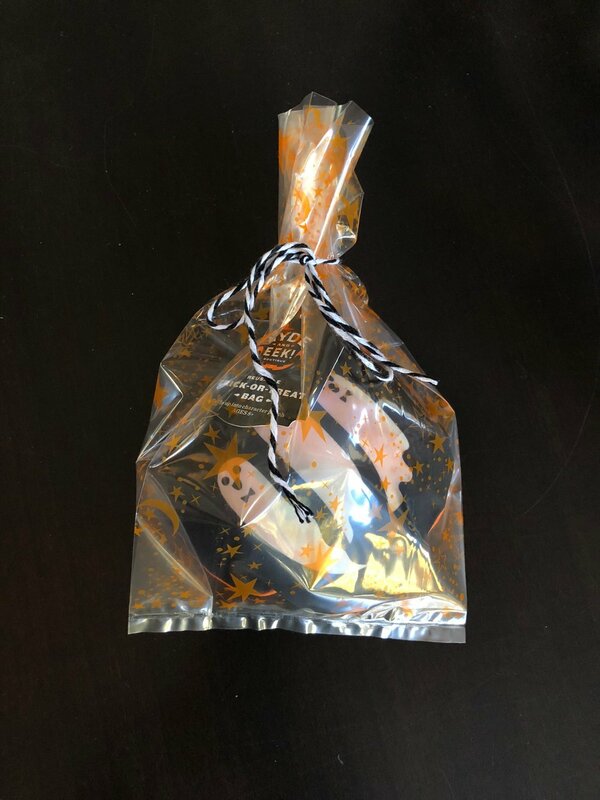 I had completely forgotten that I had stored away all of the half-off items that I bought last year for the thoughtful pinches that I would give out this year! It was one of those times that I was so grateful that my past self thought about my future self. Lol. 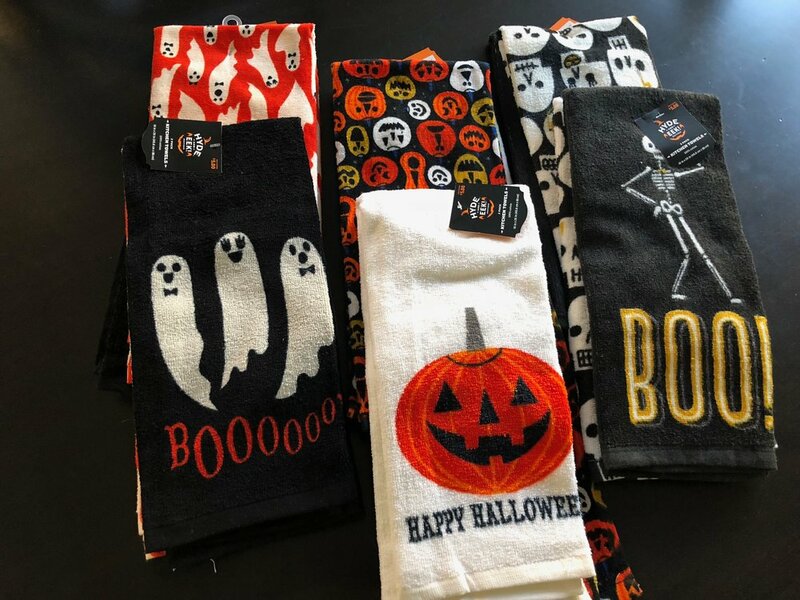 Six sets of kitchen towels all from Target. 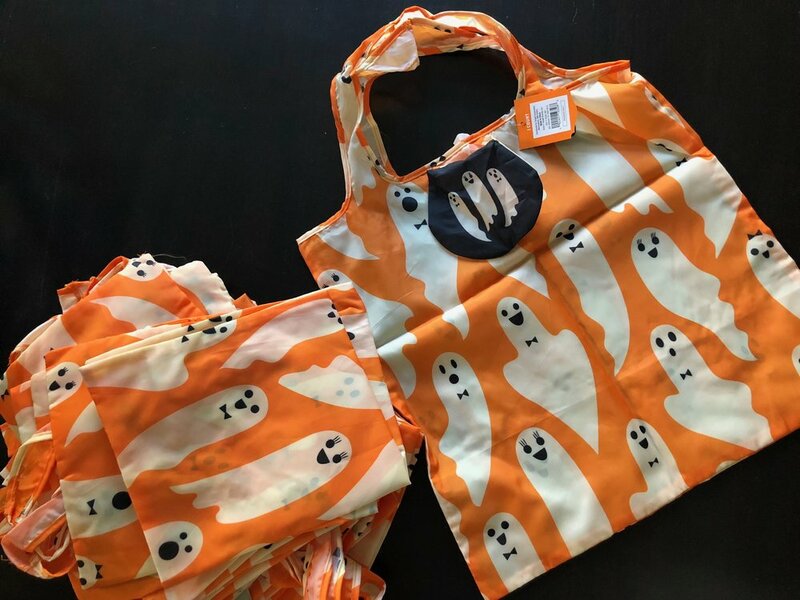 Re-useable Halloween-themed bags from Target. Most likely meant for kiddos to use for their trick or treat candy but adults can use for groceries too, right? Folds up into a cute pocket. Present it in a clear plastic bag to dress it up? What is your vote? 1. Do we give the kids in my son’s class thoughtful pinches? Yes, we’re giving his classmates something small - putty. 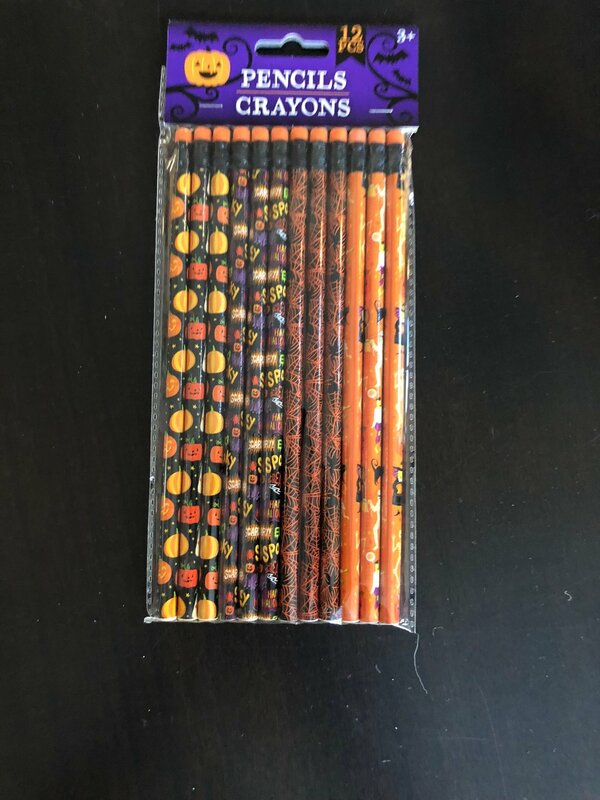 My son asked me why we give stuff to his classmates when he never gets anything from them. It was the perfect opportunity to discuss why we give. These putty packs of four were purchased at Dollar Tree. My daughter insisted on giving her nine classmates in her Advisory group a pinch so I found these “squisheez”at Dollar Tree. They are oranges, not pumpkins but the color works here. 2. 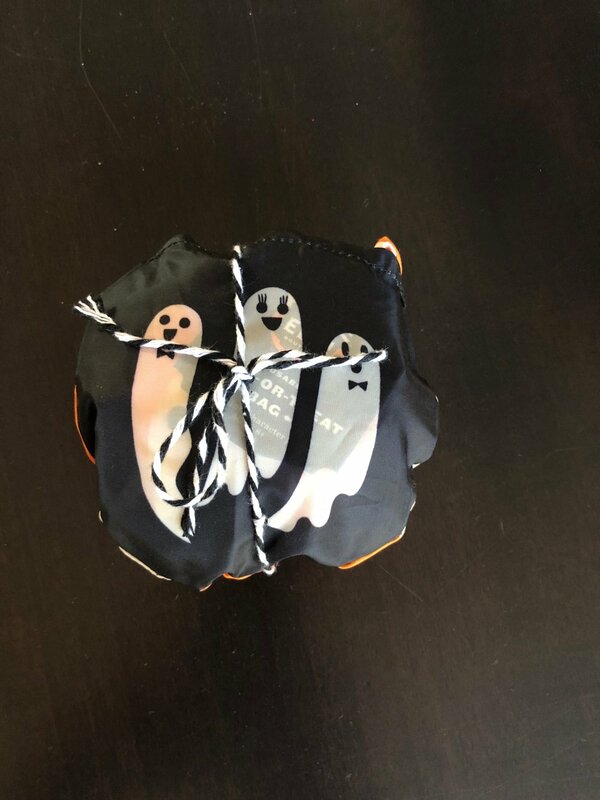 Should we give my daughter’s middle-schooler gal pals Halloween pinches or will that start a gift-giving obligation? Meaning, we’ll start with Halloween then will we have to give pinches for Thanksgiving, Xmas, V-Day etc. 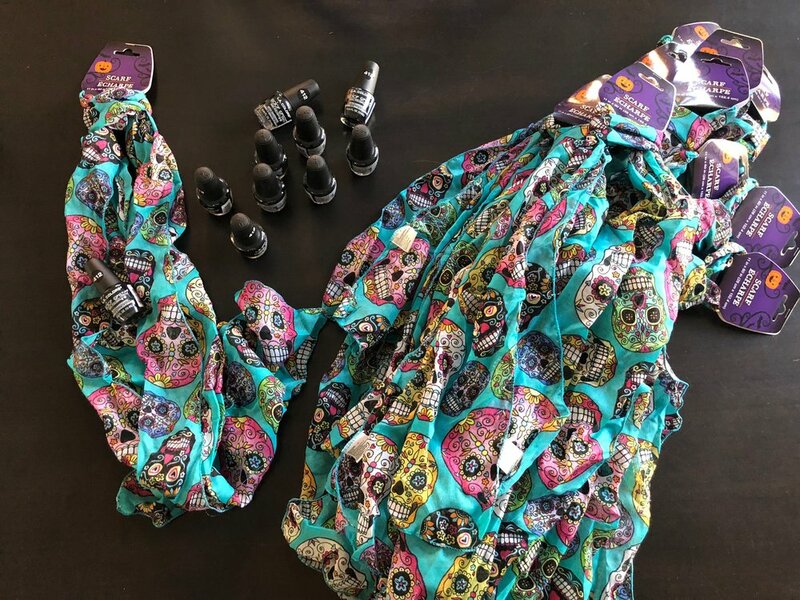 Yes, we’re giving her friends - Dia de los Muertos scarfs and black nail polish. Both items found at Dollar Tree. Cost for two items for each friend $2. I love how the movie Coco really brought awareness of this special day and that it has been celebrated simultaneously with Halloween for years. As for obligation - aka opening Pandora’s Box - let’s just take it one holiday at a time. If it’s convenient and the act of giving comes truly from the heart, then we’ll get her gal pals pinches for whatever holiday works for her. 3. 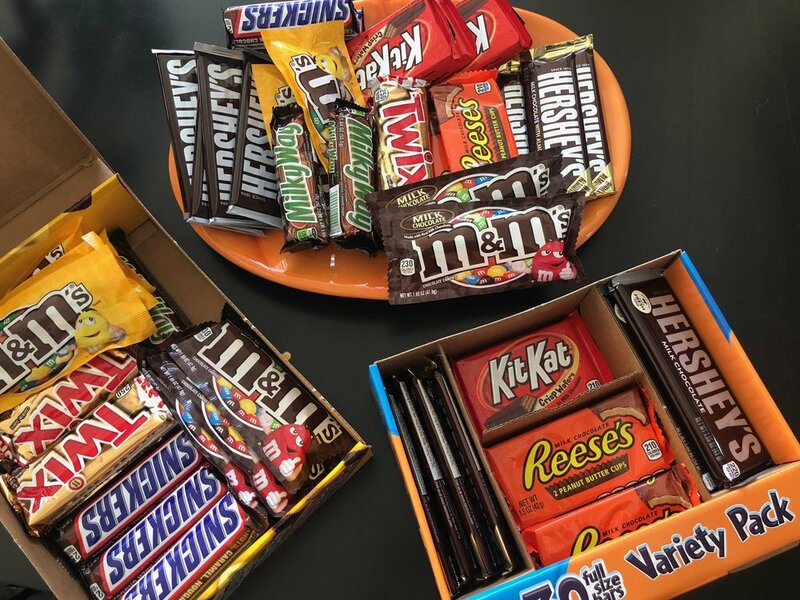 Are we going to give out regular size candy bars since we don’t get more than 50 trick or treaters? Hell yes, we’re giving out regular full size candy bars! I end up giving 5 mini candy bars to every kid when we’re all better off having a full size candy bar. Besides, Costco will take back boxes of candy that we don’t use. 4. What about the trick or treaters with nut and dairy allergies? 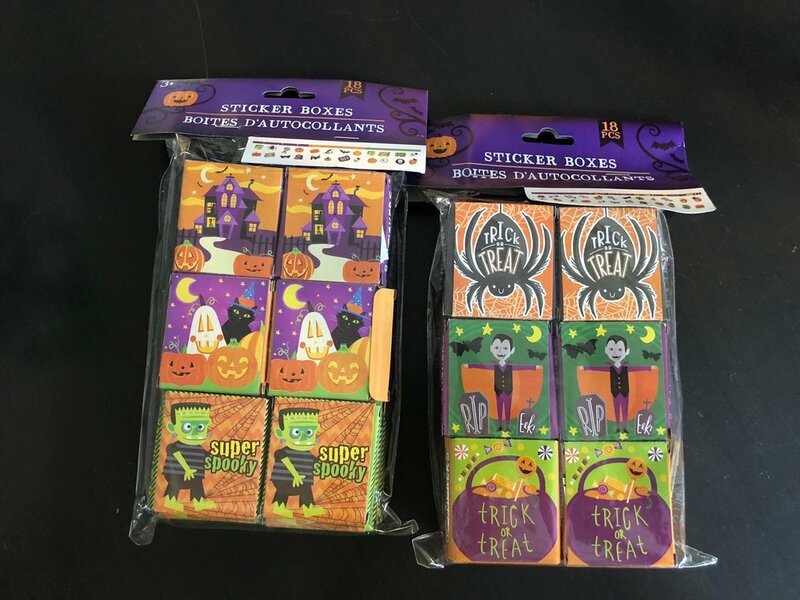 I picked up stickers, pencils and we have some left over Halloween themed trinkets from last year that will be available for the kids with allergies to choose from. Dollar Tree. Can’t beat 18 sticker boxes for $1 and 12 themed pencils for $1. 5. What am I going to give my family members? 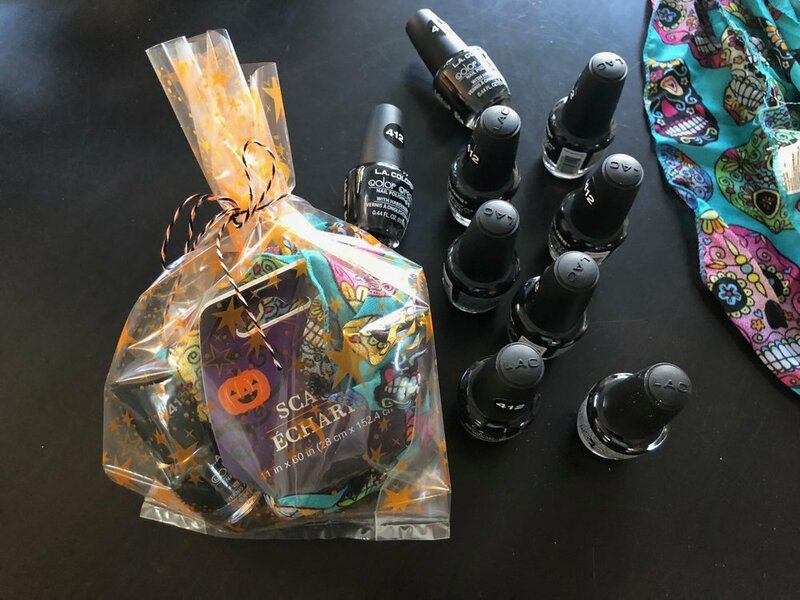 I can’t tell you what I got my family (in case the hub or my daughter read the post) but the short answer is that I didn’t get them any candy. Gifts for family members can be as big or as small as we want them to be. 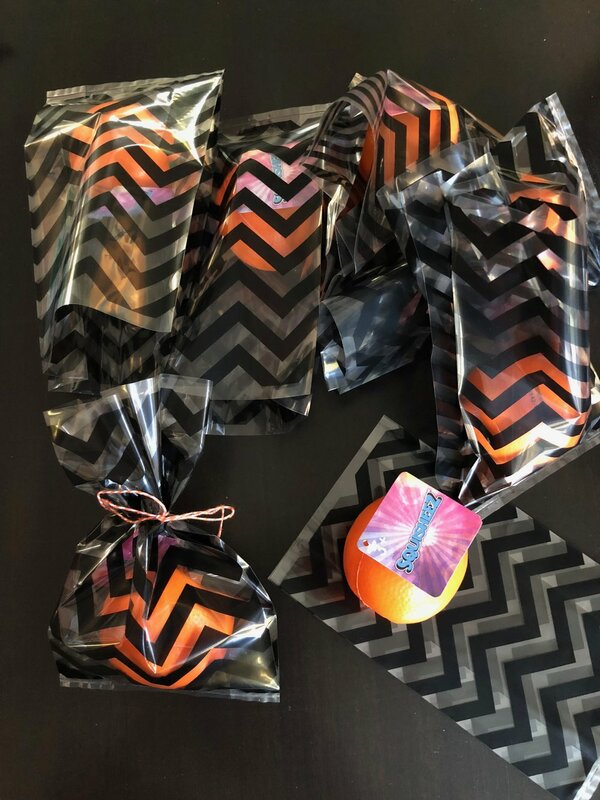 The gifts may not be extraordinary but they are special because they’re available in the colors of orange or black or the item is fun because it enhances the spirit of the holiday. 6. What is the final date that I need to send out the thoughtful pinches to our out-of-state family so that the packages make it on time and I won’t have to pay overnight fees? If I send things by October 24th then I won’t have to pay the “gun to my head” Express or Priority price tag. My intention is always to send packages via regular postage. Realistically, my end date is probably Oct 27th which means I’ll end up paying Priority rates. If the recipients get the pinches on Halloween then I can pat myself on the back for making it on time. But I’ve noticed that since there’s already so much going on, the pinches don’t have the same effect due to all the celebratory frenzy. I strive to be more like Jay-Jay; she’s a pro*. She never runs into that problem because her packages are sent many days in advance. Those of us who receive her pinches get to enjoy them with plenty of time. This is going to sound totally lame but I checked my past blog entries to find answers to some of my own questions above. Once again, I was grateful for my past self to think about my future self. Lol. The good news is that in the blog entry It’s Beginning to Look A Lot Like… I got answers to three out of the six questions above. The bad news is that I realized I wasn’t even close to being done with the Halloween thoughtful pinches. Fortunately I had a good chunk purchased last year and those were ready to go this year. Now chances are, the six freaky questions that went thru my head are not the six questions that you had in mind. In fact, giving candy to trick or treaters is the extent to what most would think about when it comes to Halloween. I shared these six questions with you so that you could have a peek at a FREAK. There you have it; I am different! I am unable to turn my brain or my heart off because I think about questions like these for almost every holiday. However, just because I’m like this, doesn’t mean I judge others who aren’t like me. The fact is every holiday could be celebrated or NOT. And every holiday could be an opportunity to show thoughtfulness or NOT. In both statements, the “not” doesn’t necessarily mean BAHUMBUG or KILL-JOY or MEAN-SPIRITED. On the contrary, “not” can represent: A) Saying “no” when you have much too much going on. B) Not spending money that you don’t have on gifts. C) Choosing to live in the moment instead of running around buying things and mailing out packages. D) Celebrating the holidays the way you feel most comfortable. All of those reasons are valid and truly admirable. I’m just FREAKY! *I cannot wait to explain more about pro. Just waiting on my trademark approval.